"Naqab" redirects here. For places in Iran, see Naqab, Iran. For the light machine gun, see IMI Negev. For the nomadic Arab tribes, see Negev Bedouin. The Negev (Hebrew: הַנֶּגֶב, Tiberian vocalization: han-Néḡeḇ ; Arabic: النقب‎ an-Naqab) is a desert and semidesert region of southern Israel. The region's largest city and administrative capital is Beersheba (pop. 207,551), in the north. At its southern end is the Gulf of Aqaba and the resort city of Eilat. It contains several development towns, including Dimona, Arad and Mitzpe Ramon, as well as a number of small Bedouin cities, including Rahat and Tel as-Sabi and Lakyah. There are also several kibbutzim, including Revivim and Sde Boker; the latter became the home of Israel's first Prime Minister, David Ben-Gurion, after his retirement from politics. The origin of the word 'negev' is from the Hebrew root denoting 'dry'. In the Bible, the word Negev is also used for the direction 'south'; some English-language translations use the spelling "Negeb". In Arabic, the Negev is known as al-Naqab or an-Naqb ("the [mountain] pass"), though it was not thought of as a distinct region until the demarcation of the Egypt-Ottoman frontier in the 1890s and has no traditional Arabic name. During the British Mandate, it was called Beersheba sub-district. The Negev covers more than half of Israel, over some 13,000 km² (4,700 sq mi) or at least 55% of the country's land area. It forms an inverted triangle shape whose western side is contiguous with the desert of the Sinai Peninsula, and whose eastern border is the Arabah valley. The Negev has a number of interesting cultural and geological features. Among the latter are three enormous, craterlike makhteshim (box canyons), which are unique to the region: Makhtesh Ramon, HaMakhtesh HaGadol, and HaMakhtesh HaKatan. The Negev is a rocky desert. It is a melange of brown, rocky, dusty mountains interrupted by wadis (dry riverbeds that bloom briefly after rain) and deep craters. It can be split into five different ecological regions: northern, western and central Negev, the high plateau and the Arabah Valley. The northern Negev, or Mediterranean zone, receives 300 mm of rain annually and has fairly fertile soils. The western Negev receives 250 mm of rain per year, with light and partially sandy soils. Sand dunes can reach heights of up to 30 metres here. Home to the city of Beersheba, the central Negev has an annual precipitation of 200 mm and is characterized by impervious soil, known as loess, allowing minimum penetration of water with greater soil erosion and water runoff. The high plateau area of Negev Mountains/Ramat HaNegev (Hebrew: רמת הנגב‎, The Negev Heights) stands between 370 metres and 520 metres above sea level with extreme temperatures in summer and winter. The area gets 100 mm of rain per year, with inferior and partially salty soils. The Arabah Valley along the Jordanian border stretches 180 km from Eilat in the south to the tip of the Dead Sea in the north. The Arabah Valley is very arid with barely 50 mm of rain annually. It has inferior soils in which little can grow without irrigation and special soil additives. Vegetation in the Negev is sparse, but certain trees and plants thrive there, among them Acacia, Pistacia, Retama, Urginea maritima and Thymelaea. A small population of Arabian leopards, an endangered animal in the Arabian peninsula, survives in the southern Negev. The Negev Tortoise (Testudo werneri) is a critically endangered species that currently lives only in the sands of the western and central Negev Desert. The Negev shrew (Crocidura ramona) is a species of mammal of the family Soricidae found only in Israel.Hyphaene thebaica or doum palm can be found in the Southern Negev. Evrona is the most northerly point in the world where this palm can be found. The Negev region is arid (Eilat receives on average only 24 mm of rainfall a year), receiving very little rain due to its location to the east of the Sahara (as opposed to the Mediterranean which lies to the west of Israel), and extreme temperatures due to its location 31 degrees north. However the northernmost areas of the Negev, including Beersheba, are semi-arid. The usual rainfall total from June through October is zero. Snow and frost are rare in the northern Negev, and snow and frost are unknown in the vicinity of Eilat in the southernmost Negev. Of the three Acacia species growing in high plateau of the Negev, Acacia pachyceras is the most cold-resistant. Nomadic life in the Negev dates back at least 4,000 years and perhaps as much as 7,000 years. The first urbanized settlements were established by a combination of Canaanite, Amalekite, Amorite, Nabataean and Edomite groups circa 2000 BC. Pharaonic Egypt is credited with introducing copper mining and smelting in both the Negev and the Sinai between 1400 and 1300 BC. In the Bible, the term Negev only relates to the northern, semiarid part of what we call Negev today, located in the general area of the Arad-Beersheba Valley. According to the Book of Genesis chapter 13, Abraham lived for a while in the Negev after being banished from Egypt. During the Exodus journey to the promised land, Moses sent twelve scouts into the Negev to assess the land and population. Later the northern part of biblical Negev was inhabited by the Tribe of Judah and the southern part of biblical Negev by the Tribe of Simeon. The Negev was later part of the Kingdom of Solomon (in its entirety, all the way to the Red Sea), and then, with varied extension to the south, part of the Kingdom of Judah. In the 9th century BC, development and expansion of mining in both the Negev and Edom (modern Jordan) coincided with the rise of the Assyrian Empire. Beersheba was the region's capital and a center for trade in the 8th century BC. Small settlements of Israelites in the areas around the capital existed between 1020 and 928 BC. Byzantine rule in the 4th century AD introduced Christianity to the population. Agricultural-based cities were established and the population grew exponentially. The southern Negev saw a flourishing of economic activity during the 8th to 10th or 11th centuries. Six Islamic settlements have been found in the vicinity of modern Eilat, along with copper and gold mines and stone quarries, and a sophisticated irrigation system and road network. The economic center was the port of Ayla (Aqaba). Nomadic tribes ruled the Negev largely independently and with a relative lack of interference for the next thousand years. What is known of this time is largely derived from oral histories and folk tales of tribes from the Wadi Musa and Petra areas in present-day Jordan. The Bedouins of the Negev historically survived chiefly on sheep and goat husbandry. Scarcity of water and of permanent pastoral land required them to move constantly. The Bedouin in years past established few permanent settlements, although some were built, leaving behind remnants of stone houses called 'baika.' In 1900 the Ottoman Empire established an administrative center for southern Syria at Beersheba including schools and a railway station. The authority of the tribal chiefs over the region was recognized by the Ottomans. A railroad connected it to the port of Rafah. In 1914 the Turkish authorities estimated the nomadic population at 55,000. A map considered by the British Cabinet in 1918 suggested that the Negev could be included in either Palestine or Egypt. The 1916 Sykes-Picot Agreement between Britain and France placed the Negev in Area B, "Arab state or states" under British patronage. The Negev was taken from the Ottoman army by British forces during 1917 and became part of Mandatory Palestine. In 1922, the Bedouin component of the population was estimated at 72,898 out of a total of 75,254 for the Beersheba sub-district. The 1931 census estimated that the population of the Beersheba sub-district was 51,082. This large decrease was considered to be an artifact of incorrect enumeration methods used in 1922. An Arabic history of tribes around Beersheba, published in 1934 records 23 tribal groups. In 1948 the Negev came under Israeli rule. In the early years of the state, it absorbed many of the Jewish refugees from Arab countries, with the Israeli government setting up many development towns, such as Arad, Sderot and Netivot. Since then, the Negev has also become home to many of the Israel Defense Forces major bases - a process accelerating in the past two decades. As of 2010, the Negev was home to some 630,000 people (or 8.2% of Israel's population), even though it comprises over 55% of the country's area. 470,000 Negev residents or 75% of the population of the Negev are Jews, while 160,000 or 25% are Bedouin. Of the Bedouin population (a demographic with a semi-nomadic tradition), half live in unrecognized villages, and half live in towns built for them by the Israeli government between the 1960s and 1980s; the largest of these is Rahat. The population of the Negev is expected to reach 1.2 million by 2025. It has been projected that the Beersheba metropolitan area will reach a population of 1 million by 2020, and Arad, Yeruham, and Dimona will triple in size by 2025. Blueprint Negev is a Jewish National Fund project introduced in 2005. The $600 million project hopes to continue Israel's past environmental successes in 'making the desert bloom' and attract 500,000 new Jewish residents to the Negev by improving transportation infrastructure, establishing businesses, developing water resources and introducing programs to protect the environment. A planned artificial desert river, swimming pools and golf courses raised concerns among environmentalists. Critics oppose those plans, calling instead for an inclusive plan for the green vitalization of existing population centers, investment in Bedouin villages, clean-up of toxic industries and development of job options for the unemployed. A major Israel Defense Forces training base is being constructed in the Negev to accommodate 10,000 army personnel and 2,500 civilian staff. Three more bases will be built by 2020 as part of a plan to vacate land and buildings in Tel Aviv and central Israel, and bring jobs and investment to the south. The Negev Desert and the surrounding area, including the Arava Valley, are the sunniest parts of Israel and little of this land is arable, which is why it has become the center of the Israeli solar industry. David Faiman, an expert on solar energy, feels the energy needs of Israel's future could be met by building solar energy plants in the Negev. As director of Ben-Gurion National Solar Energy Center, he operates one of the largest solar dishes in the world. 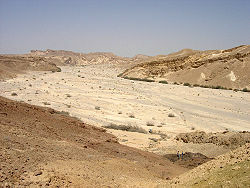 Technically, however, the Arava is a separate desert with its own unique climate and ecology. A 250 MW solar park in Ashalim, an area in the northern Negev, the Ashalim Power Station, produces 121 Megawatts of energy, using solar mirrors and thermal water heating. It is currently the largest in Israel. The Rotem Industrial Complex outside of Dimona, Israel, has dozens of solar mirrors that focus the Sun's rays on a tower that in turn heats a water boiler to create steam, turning a turbine to create electricity. Luz II, Ltd., plans to use the solar array to test new technology for the three new solar plants to be built in California for Pacific Gas and Electric Company. Vines have been planted in the Negev since ancient times. In modern times, vineyards have been established in the northern Negev hills using innovative computerized watering methods for irrigation. Carmel Winery was the first of the major wineries to plant vineyards in the Negev and operates a boutique winery at Ramat Arad. Tishbi has vineyards at Sde Boker and Barkan grows its grapes in Mitzpe Ramon. Yatir Winery is a boutique winery in Tel Arad. Its vineyards are on a hill 900 meters above sea level on the outskirts of Yatir Forest. Carmey Avdat is Israel's first solar-powered winery. The Negev is home to hazardous infrastructures that include Negev Nuclear Research Center nuclear reactor, 22 agrochemical and petrochemical factories, an oil terminal, closed military zones, quarries, a toxic waste incinerator at Ne'ot Hovav, cell towers, a power plant, several airports, a prison, and 2 rivers of open sewage. In 2005, the Tel Aviv municipality was accused of dumping waste in the Negev at the Dudaim dump. The Manufacturers Association of Israel established an authority in 2005 to move 60 industrial enterprises active in the Tel Aviv region to the Negev. In 1979, the Ramat Hovav toxic waste facility was established in Wadi el-Na'am because the area was perceived as invulnerable to leakage. However, within a decade, cracks were found in the rock beneath Ramat Hovav. In 2004, the Israeli Ministry of Health released Ben Gurion University research findings describing the health problems in a 20 km vicinity of Ramat Hovav. The study, funded in large part by Ramat Hovav, found higher rates of cancer and mortality for the 350,000 people in the area. 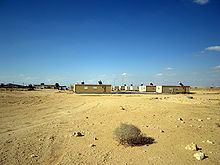 Prematurely released to the media by an unknown source, the preliminary study was publicly discredited; However, its final conclusions – that Bedouin and Jewish residents near Ramat Hovav are significantly more susceptible than the rest of the population to miscarriages, severe birth defects, and respiratory diseases – passed a peer review several months later. ^ Gattegno, Ilan (October 26, 2012). "Negev named among top ten travel destinations for 2013". Israel Hayom. Archived from the original on October 6, 2014. Retrieved October 29, 2012. ^ "Best in Travel 2013 - Top 10 regions". Lonely Planet. October 23, 2012. Archived from the original on March 9, 2013. Retrieved April 2, 2013. ^ Moshe Sharon (1997). 'Aqabah (Ailah). Corpus Inscriptionum Arabicarum Palaestinae. Handbook of Oriental Studies/Handbuch Der Orientalistik. Leiden & Boston: Brill Academic Publishers. pp. 89–90. ISBN 9789004108332. Archived from the original on 23 November 2015. Retrieved 1 May 2015. In fact, there are two mountain passes through which the road of Aylah has to cross. The western one crosses the mountain ridge to the west of the gulf, and through it passes the main road from Egypt which cuts through the whole width of Sinai, coming from Cairo via Suez. This mountain pass is also called 'Aqabat Aylah, or as it is better known, "Naqb al-'Aqabah" or "Ras an-Naqb." ^ Hertzog, Esther; Abuhav, Orit; Goldberg, Harvey E.; Marx, Emanuel (8 May 2018). "Perspectives on Israeli Anthropology". Wayne State University Press. Archived from the original on 26 March 2016. Retrieved 8 May 2018 – via Google Books. ^ a b Palestine Exploration Quarterly (April 1941). The Negev, or Southern Desert of Palestine by George E. Kirk. London. Page 57. ^ Bailey, C.; Danin, A. (1981). "Bedouin plant utilization in Sinai and the Negev". Economic Botany. 35 (2): 145. doi:10.1007/BF02858682. ^ "Gulf-Environment: Arabian Leopard Faces Extinction". highbeam.com. Archived from the original on 5 May 2016. Retrieved 8 May 2018. ^ "Re-introduction - Negev tortoise". jerusalemzoo.org.il. Archived from the original on 15 December 2013. Retrieved 8 May 2018. ^ "Crocidura ramona (Negev Shrew)". www.iucnredlist.org. Archived from the original on 2 November 2016. Retrieved 8 May 2018. ^ "Beersheba, ISR Weather". MSN. Archived from the original on 2007-11-17. Retrieved 2008-01-25. ^ "Averages and Records for Beersheba (Precipitation, Temperature and Records [Excluding January and June] written in the page)". Israel Meteorological Service. August 2011. Archived from the original on 2010-09-14. ^ "Records Data for Israel (Data used only for January and June)". Israel Meteorological Service. Archived from the original on 2011-08-23. ^ a b Israel Finkelstein; Avi Perevolotsky (Aug 1990). "Processes of Sedentarization and Nomadization in the History of Sinai and the Negev". Bulletin of the American Schools of Oriental Research (279): 67–88. ^ J. M. Tebes (2008). "Centro y periferia en el mundo antiguo. El Negev y sus interacciones con Egipto, Asiria, y el Levante en la Edad del Hierro (1200-586 A.D.) ANEM 1. SBL - CEHAO" (PDF). uca.edu.ar. ^ Evenari, Michael; Shanan, Leslie; Tadmor, Naphtali (8 May 1982). "The Negev: The Challenge of a Desert". Harvard University Press. Retrieved 8 May 2018 – via Google Books. ^ a b c Uzi Avner and Jodi Magness (1998). "Early Islamic settlement in the Southern Negev". Bulletin of the American Schools of Oriental Research. 310: 39–57. doi:10.2307/1357577. ^ Map from CAB 24/72/7 Archived 2016-11-07 at the Wayback Machine: "Maps illustrating the Settlement of Turkey and the Arabian Peninsula", forming an annex to: CAB 24/72/6 Archived 2016-11-07 at the Wayback Machine, a British Cabinet memorandum on "The Settlement of Turkey and the Arablan Peninsula"
^ Gideon Biger (2004). The Boundaries of Modem Palestine, 1840-1947. RoutledgeCurzon. p. 64. ^ Census of Palestine 1931, Volume I. Palestine Part I, Report. Alexandria, 1933, p49. ^ Palestine Exploration Quarterly. (October 1937 & January 1938) Notes on the Bedouin Tribes of Beersheba District. by S. Hillelson. Translations from A History of Beersheba and the Tribes thereof (Ta'rikh Bir al-Saba' wa qaba'iliha). by 'Arif al-'Arif. ^ "A Bedouin welcome - Israel Travel, Ynetnews". Ynetnews.com. 1995-06-20. Archived from the original on 2011-06-29. Retrieved 2011-10-09. ^ Udasin, Sharon. "'1.2 million residents in the Negev by 2025' | JPost | Israel News". JPost. Archived from the original on 2012-09-30. Retrieved 2014-01-19. ^ "תוכנית באר שבע אושרה; המטרה – מיליון תושבים עד שנת 2020". Calcalist.co.il. 1995-06-20. Archived from the original on 2014-02-03. Retrieved 2014-01-19. ^ Orenstein, Daniel (March 25, 2007). "When an ecological community is not". haaretz.com. Archived from the original on September 25, 2009. ^ Daniel Orenstein and Steven Hamburg (November 28, 2005). "The JNF's Assault on the Negev". The Jerusalem Report. watsoninstitute.org. Archived from the original on October 19, 2007. Retrieved August 7, 2008. ^ "Ohalah resolution". neohasid.org. Archived from the original on 2013-07-02. ^ "Neohasid's Save the Negev Campaign". neohasid.org. Archived from the original on 2013-12-15. ^ Manski, Rebecca (9 November 2010). "Blueprint Negev". MERIP/Mondoweiss. Archived from the original on 15 August 2014. Retrieved 23 January 2015. ^ "Subscribe to read". Financial Times. Archived from the original on 20 August 2016. Retrieved 8 May 2018. ^ Ehud Zion Waldoks (March 10, 2008). "Head of Kibbutz Movement: We will not be discriminated against by the government". Jerusalem Post. Archived from the original on July 13, 2011. Retrieved February 4, 2011. ^ Lettice, John (January 25, 2008). "Giant solar plants in Negev could power Israel's future". The Register. Archived from the original on September 29, 2013. ^ "Calif. solar power test begins — in Israeli desert". Associated Press. June 12, 2008. Archived from the original on December 8, 2012. Retrieved December 23, 2008. ^ Rabinovitch, Ari (June 11, 2008). "Israel site for California solar power test". Reuters. ^ Washington (2008-05-08). "Building Small Prototype Homes, an Israeli Solar Experiment | News | English". Voanews.com. Archived from the original on 2009-08-26. Retrieved 2011-10-09. ^ Rogov, Daniel (2009). Rogov's Guide to Israeli Wine. London, England: Toby Press. p. 467. ISBN 978-1613290194. ^ "Sunday Energy and Carmey Avdat Winery Helping Produce Israel's First Solar Powered Wine". greenprophet.com. Archived from the original on 25 March 2017. Retrieved 8 May 2018. ^ a b Manski, Rebecca. "Bedouin Vilified Among Top 10 Environmental Hazards in Israel". AIC. Archived from the original on 5 December 2013. Retrieved 12 April 2013. ^ Berger, Gali (October 12, 2005). "Sin of waste / Municipal garbage that's out of sight, out of mind". Haaretz. boker.org.il. Archived from the original on June 9, 2011. ^ Manor, Hadas (August 11, 2005). "Manufacturers promoting transfer of 60 factories to Negev". Globes. boker.org.il. Archived from the original on November 22, 2005. ^ Manski, Rebecca (2005). "The Bedouin as Worker-Nomad". bustan.org. Archived from the original on 2011-10-03. ^ Sarov, Batia, and peers at Ben Gurion University: “Major congenital malformations and residential proximity to a regional industrial park including a national toxic waste site: An ecological study;” Environmental Health: A Global Access Science Source 2006, 5:8; Bentov et al., licensee BioMed Central Ltd.
Wikivoyage has a travel guide for Negev.